About 3.5 billion people live in countries rich in oil, gas, or minerals. Many of these countries also suffer from poverty, corruption, and conflict stemming from weak governance. Nonrenewable mineral resources play a dominant role in 81 countries, which collectively account for a quarter of gross world product, half of the world’s population, and nearly 70 percent of those in extreme poverty. The World Bank Group’s involvement in extractive industries seeks to help countries seize the opportunities that mining companies offer for development, poverty reduction, and boosting shared prosperity. Most World Bank Group interventions in extractive industries are in the governance area, to encourage transparent management of industry revenues so that they provide benefits for local people and so that the industries themselves respect local community needs and the environment. At the same time, more than one-quarter of the world’s active mines and exploration sites overlap with, or are situated within, a 10-kilometer radius of, a strictly protected area. Nearly one-third of all active mines and exploration sites are located within areas of intact ecosystems of high conservation value, most of them forests. Almost one-third of all active mines are located in stressed watersheds. Infrastructure developments associated with oil and mineral developments represent the most important threat to ecosystems through physical incursion into forests and disruption of the ecosystems. Road and railway development could be particularly harmful. Building a new road drives direct deforestation through tree cutting, but this impact is generally limited. Most importantly, roads are the major vehicle for forest degradation through further incursion into forest areas for agriculture, hunting, artisanal mining, and other potentially harmful activities. Added to that, a large-scale mine has considerable energy requirements, which will lead to the construction of hydropower dams, oil and gas pipelines, and power lines. Nevertheless, oil and mining companies can contribute considerably to sustainable forest management, and have done so in the past, by implementing measures for forest conservation and community development in and around their concessions. There is increasing pressure on individual companies to implement standards to mitigate and offset negative environmental impacts. Yet there is a limit to what private-sector-driven, project-specific measures can do. 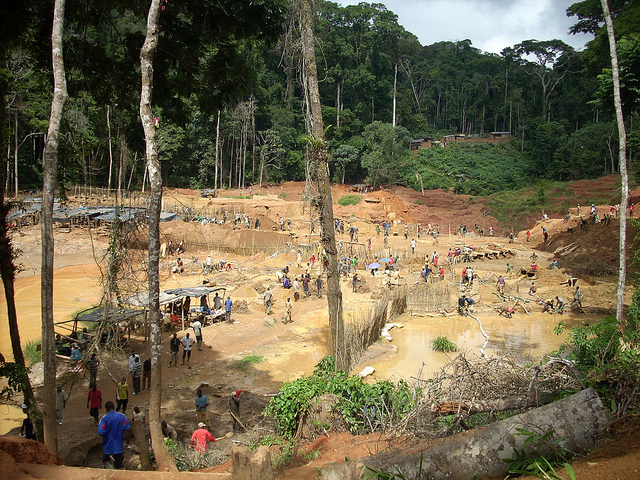 These kinds of voluntary standards also tend not to affect artisanal and small-scale miners and other "rogue" players, who tend to have the largest environmental footprint. In order to address all players, an integrated landscape-level planning and enforcement process is needed. This program will transform the way the World Bank Group works with its clients on extractive industries in forest-rich countries, so that oil, gas, and mineral extraction contribute to sustainable forest management and poverty reduction for the people depending on those forests. The program also introduces this knowledge to the Bank's vast networks of private companies and government partners. Activities have been chosen based on the most urgent issues impacting the forest sector, and existing World Bank Group projects that have the potential for the greatest impact and replicability. Two major studies are underway, focused on Artisanal and Small-Scale Mining (ASM) and Large-Scale Mining (LSM), and how to make these sectors forest-smart.The lessons and recommendations will be based on both good and bad practices in different parts of the world, looking at a range of geographical, governance, and ecological factors. The two studies include analysis of the thematic areas and the identification of 15-20 case studies each, following a detailed analytical framework that was developed to support consistency and comparability. The studies on LSM and ASM are being finalized. They focus on 10 critical minerals where extractive activities bear the greatest implications for forests. Early results indicate that certain minerals are overwhelmingly sourced from mines located in forests, including bauxite (80 percent) and manganese (63 percent). This category also applies to a quarter of mined diamonds and gold. Importantly, many of these mines are located in ecosystems of high conservation value. Moreover, in the top 13 countries with high levels of artisanal mining activity, forest cover is on the decline. These early findings highlight the global importance of identifying and promoting forest-smart solutions.